Lamps in Natural and Brown by Manhattan Comfort at My Natures Treasures. MPN: AMC95003-7. Hurry! Limited time offer. Offer valid only while supplies last. Includes one candelabra 15 watt base bulb. Carved from natural Himalayan salt crystals and mined by local artisans in the Himalayan mountains. Includes one candelabra 15 watt base bulb. Carved from natural Himalayan salt crystals and mined by local artisans in the Himalayan mountains. Perfect for office, bedroom, living room and spa settings. Sphere shaped rock on a sturdy round polished wooden base. Purify your surroundings through the heat emanated by the lamp. 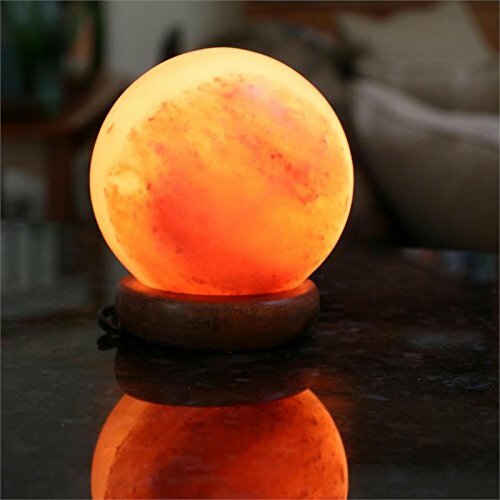 Calming amber color is released when lamp is lit. Light from the glowing lamp is soft, gentle, and relaxing. Weight and color may vary due to the natural variation in the Himalayan crystal salt. Great complement to meditation routines and also makes a beautiful and unique gift. Safe UL approved dimmer cord and lamp. 6.5 ft. L power cord with dimmer to accommodate your lighting preferences. Made from pure food grade salt. Warranty: 90 days limited. No assembly required. 6.25 in. Dia. x 6 in. H (7.5 lbs. ).